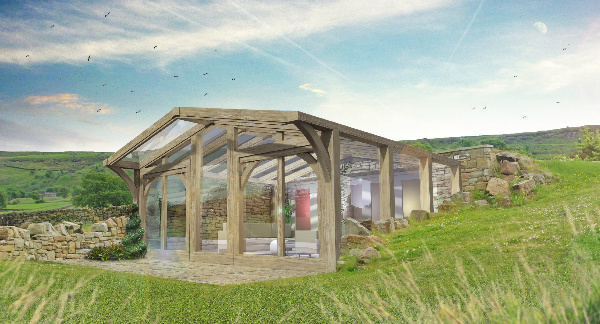 We are currently progressing detailed designs for this unusual but exciting project near Ilkley Moor, which consists of a fully underground section of living accommodation including a bedroom and bathroom, along with a projecting oak-framed glazed annexe which will house a kitchen, dining area and living room accommodation. The hurdle of obtaining planning permission for this Green-Belt located site has already been overcome, and detailed fit-out drawings are now due to be prepared. The structure will be largely sunk into the side of a hill, with the oak framed glazed annexe projecting outwards enjoying panoramic views of Ilkley Moor, the Wharfe Valley and surrounding countryside. We will keep our project page updated with more updates over the summer….